Great Fall Camporee this year. The location of this year’s Fall Camporee was at the beautiful Ransburg Scout Reservation in Bloomington, Indiana. Our theme for this camporee was Reality Show Challenge. We had several challenges for Troops to figure out together. The team competitions were designed to foster teamwork, decision making and strategy. PLUS!!! Here is the link of their Camp Fire song... "ScoutMaster Wehrheim!" Well the humorist in me is going to tell you it's because they are all exhausted, but I really think there's a little magic to this place. A boy feels at home in nature. He can reconnect to the outdoors and revisit some memories of camps from his past and for the new Scouts, he can find his first taste of freedom and explore what Mother Nature has to offer. You know, once they are bitten by that "camping bug", there's no cure for it - well, other than more camping. It can be a scary time for a kid to be away from home for a week, but just like all of the Scouts that have came before them, they find a way to connect to nature. It can be a little unfamiliar at first, then there's the realization that this seems "right" in a way. Boys crave adventure and we sometimes tend to keep them from it. It's too dangerous, or you will get hurt, or your not old enough. I had a chance to really watch some of our Scouts discover things about themselves that they didn't know they could do. Not just high adventure stuff, I mean the simple things. Hearing a child realize what the sound of the summer breeze sounds like late at night when it blows through the trees. Watching a kid get a glimpse of his first deer walking around in the woods. Hearing that "bump in the night" on Monday and being scared, then realizing it's just a raccoon in the garbage can and a couple of nights later, totally ignore it because it's not scary anymore. Really enjoy and marvel at how bright a full moon is in the forest. Get his first sun burn......and survive without Mom. Then we get to see the older boys have that same sense of wonder as well. Climb a rock wall and "live to tell about it". Take his first sailboat out on the water. Make a fire the way it has been done for thousands of years and seeing their faces light up when they blow the ember into flames. Watching a kid that is so shy he hardly speaks above a whisper, then see him perform in front of dozens. Then seeing him do it again the very next night with a confidence he didn't know he had. This stuff happened here. This week. and these are your kids. Thank you for allowing us to make these memories with your boys. "Strive For Excellence, Exceed The Standards"
Hello all and Good morning, Awesome, Awesome, Awesome!!!!!!! That's how we would describe today's activities. Okay, so here's the quick run down of today before we get to the meat of the email, which is the visit! We got the boys up at 6:30 this morning for breakfast and the opening flag ceremony, which is the daily ritual here at camp. It is a very welcome and patriotic site to see. The camp does a wonderful job conducting flags, both in the morning as well as the evening flag lowering ceremony. It is a tradition that seems to be lost in modern day society, but is upheld and conducted in the highest honor in Scouting. Breakfast was sausage, pancakes, fruit and cereal with milk, juice and water. Lunch was beef burritos with fresh toppings including rice, lettuce and diced tomatoes, cheese and picante sauce. Dinner was..............with you guys!!!!!! What a wonderful experience the kids had with you guys here. It was a welcome site for the boys to have all of you here and the spirits were very high as we headed off to our selected restaurants. All of the boys experience a love/hate feeling with the visit, because they are really excited to see you guys, but it's a little difficult when you have to leave. A few of the guys had a little harder time than some and we saw some tears - just like we see every year. You guys did a great job being supportive of your sons, but made the right decision by leaving them here. It's that decision that will make them stronger in the long run and gives them the "can do" attitude that makes them more independent, more confident and more mature. They will remember this campout for the rest of their life and their determination to stick it out. You guys giving them the extra little nudge will be a huge payoff in the long run, we promise. As we described, the tears were gone in about 20 minutes after you guys left and they were all laughing again. Today we saw a huge uptick in the boys that are working on the Firecrafter advancements. There are three ranks that can be achieved. Camper (11 year old and older), Woodsman (12 years old and older), and Firecrafter (13 years old and older). We started with a few boys working on these ranks but with the 7 Firecrafter candidates we have, the opportunity for the rest of the boys to achieve these ranks was contagious and now we have 1/2 of our Troop working on some type of Firecrafer advancement. Firecrafter is a very honorable portion of Boy Scouts and the 3 High Ideals of the Firecrafter organization are, "Friendship, Leadership, Service". As far as the other advancements, they are doing really well. Everyone is going to their classes and seems to be having a good time. Guys, let me explain just why we are so proud of them. These kids are not given anything - they earn it. They are obtainable goals and badges, but if they do not meet the standard, they do not pass. They must finish what they started at a later date. For example, my son started a "Wilderness Survival" class his first year. It sounds fun and exciting, up until the part where you are required to go out into the woods alone and build your survival shelter - then spend the night alone in it. Okay, so the "alone" part is not far away from the adults in the Troop, but when you're 11, it seems like miles and miles away. My son completed all of the requirement except for spending the night in his shelter. He waited until the following year to complete it. So with that said, you can see that they truly earn their rank advancement here. Well, we'll see you guys in a few days and I'll send another update tomorrow!!!!!! Thanks to those who were able to make it tonight and again, we are so very proud of each and every one of our boys - they truly make us proud!!!!! Well another good day here at camp. The weather has been nice and somewhat cool through lunch. Today seemed to be a little better than the last two days, perhaps the humidity was a little lower. Still a good breeze but no showers today. Maybe that's what kept the humidity at bay. The food was what you'd come to expect -- awesome!! (Okay, even for "camp food" it's pretty good). For breakfast there was biscuits and gravy, fruit, cereal and milk. Lunch was really tasty - ham and cheese sandwiches on really good hoagie bread - you know, the type of bread that when you bite into it, part of it sticks to the roof of your mouth. It was that fresh. Anyway, in accompaniment to the sandwiches were corn chips, fruit, salad, and ice cream for dessert. Dinner was Alfredo noodles in a cream sauce with grilled chicken, steamed vegetables and rolls, salad and cake with chocolate icing. The guys were having fun again today, with some of the boys taking advantage of the days of summer enjoying some time at the lake and swimming, sailing and fishing. Others went rappelling off of a 60' vertical wall tower, some were shooting rifles and shot guns, some were having an awesome time learning about nuclear science, engineering, metal working, carpentry, veterinarian studies, physical fitness, and working on Firecrafter. I'm sure I've missed some, but they are all so busy with stuff, we haven't had a chance to see it all as of yet!! Right on schedule, we are having a twinge of homesickness from a few of the guys, but they're holding their own. It happens every year right around this time (2 or 3 days into summer camp) when they begin to realize they are really are going to be gone for a week. This is totally normal and there is nothing to be worried about. It's a combination of the heat (most of us aren't used to spending ALL day outside), the new sleeping quarters (tents and cots are not air conditioned bedrooms and comfy beds), the physical activity (not only are they busy doing their classes and such, they must walk to each and every event. Classes, all three meals, showers, tents and such), and a little sleep deprivation. Nothing to be concerned about, it's just takes a few days to get used to a new sleeping environment. They are usually going to bed around 10 or 11 and getting up around 6:30 or so. For you new Scouting parents, let me encourage you to support your son on his Scouting journey. When you arrive tomorrow night, be excited and interested (as we all know you are) listen and talk, visit and catch up, enjoy your meals together and your fellowship with one another. Come back to camp and take a tour of the camp site and our "home" here at Squirrel's Den, see what your Scout has been up to. If your son is feeling a bit homesick and wants to go home, I would ask that you strongly reconsider this decision. Perhaps explain to them that the week is almost over, there's Thursday and then Friday, then they come home on Saturday morning. He's made it this far and can tough it out for a couple more days. If you have any questions or need help in this area, talk to us - we're here to support you as well. In no way are we trying to tell you how to parent your children, just offering a little idea or two from a few parents who were in your shoes just a couple of summers ago. Well it’s been a great day here at Ransburg!! Weather was cooperative and again, we were blessed with a nice breeze all day as well as cool and pleasant temperatures through lunch. The boys enjoyed a full breakfast of scrambled eggs, sausage, coffee cake and fresh fruit. Lunch was also enjoyable, where we enjoyed baked beans, hot dogs with chili sauce and peaches…..And ahhhh, those desserts!! The adults have all commented that we had anticipated returning home lighter than when we arrived, but if they keep feeding us like this, I think our plan will fail miserably!!! The morning sessions began around 9 am with the boys heading off to their classes and electives. We took advantage of the sheer number of adults and split off to watch our boys in action. There was metal working, carving, rifle shooting, shot gun shooting, archery, canoeing, small boat sailing, equestrian training, just to name a few. A number of the boys are working on their Firecrafter rank, with the Troop participating in a campfire program that each boy must put on. There is a great deal of planning and participation that goes in to these programs and our Troop is really supporting their efforts. Dinner was just as wonderful, where we enjoyed chicken fried steak and gravy, corn, salad, rolls and a wonderful peach cobbler for dessert. The evening has brought us cooler temperatures and we are still happy to have that pleasant breeze. Again, no signs of homesickness – the one “sickness” us adults are dreading the most – but all of the boys are doing great and getting along wonderfully. I really think it’s been a great experience for them and they are creating some wonderful memories together. I know the adults are proud to see them bonding, supporting one another and demonstrating the Scout Spirit. They are something to see and they are all making us very proud. We have had many compliments on their behavior, uniforms, and esprit de corps. They are representing you very well!! We’ll send more tomorrow. You guys keep up your spirits and know that your boys are in good hands and having the time of their lives!! We know you miss them, but stay strong and know they are growing mentally, physically and emotionally all thanks to you allowing them to experience all that encompasses Scouting!! Well we departed New Pal Lion's Club pretty much on time. I think our leaders wanted us to get out of there around 10:30 am and we pulled out about 10:40 or so. The packing of the trailer on Friday really made our departure uneventful and far less stressful on us all. The boys were in high spirits as we left and the ride down here was great. Very light traffic on the roads and very light construction through town, which is a very welcome change for the adults who have been driving down here for a few years. We arrived at Ransburg around 12:50 and were the first in line. The adult leaders had all of our paperwork in order and the check in was the quickest I think I've seen in the three years I've been coming here!! We arrived to a very warm camp, with temps in the mid 90's I think. Our troop Guide, JT (he's on staff here at the camp), is a very fun and comical guy who really made the boys feel welcome and at home. He took us on a tour of the camp and showed the boys around our camp site - we are staying in Squirrel's Den this year. It's a nice spot that's close to the water and it sits on the top of a small ridge just off of the lake. The camping site is covered with very large and mature trees, with a gentle slope down to the lake that has provided us with a very nice summer breeze all day long and plenty of welcome shade. All of the boys went to the aquatic center after our tour and participated in the safety check in. These guys are VERY serious around the water and they do a fantastic job making sure our boys are swimming safely. There's a ton of life guards on duty down there and the ratio for swimmers to guards is about 8 to 1 respectively. We went to dinner at 5:30 or so and enjoyed a fine meal of grilled chicken, green beans, seasoned yellow rice, rolls and salad.....then came dessert! Some type of cake with whipped topping icing and fruit. These guys really feed your kids well. They offer seconds on every meal and there's water, juice and milk to drink. For tonight, there's a camp fire planned for 8, which is always fun. The staff will perform hilarious skits and it has the kids rolling in the isles. After that, lights out around 10 or 11. No homesickness as of yet and everyone seems to be having a great time. We are really staying after the kids about their water intake and making them drink every chance they get. More to come tomorrow!!!! We will meet at the New Palestine Lions Club on Friday, May 4, and drive to Dunes National Park in Chesterton, IN. Since we will not arrive at the park until late, an advance party will go up earlier and set up camp. We will be spending Saturday in Chicago (via train) exploring. Lunch will be on the local economy returning to the park in the afternoon to have time back at the park. We will break camp after Sunday morning vespers, and return to the Lions Club Sunday noontime. Leaders will be planning and preparing all the meals. Here is the physical form which all adults and youth participating in summer camp at Ransburg will need to have completed. Parts A, B, and C are required. The Pioneer District Spring Camporee! Spring Camporee 2012 will take place from April 13 to April 15 at Camp Kikthawenund in Frankton, Indiana. Each troop will pick a Scout skill or subject and put on a demonstration at their campsite. Campsite competition at this Camporee: Troops should be prepared to set up their campsite neatly and safely to score as many points as possible. Judging will be based not only on camp gadgets, but on basic safety issues and camp layout (patrol method, proper use of equipment, etc.). Few clean-up activities will make you feel like a genuine pioneer man than cleaning a cast-iron skillet without water. You might ask yourself is that even possible? The answer is yes, the process is simple, and here is what you need to do to get this dirty cast iron pan clean. You’ll need salt, paper towels and a scraping tool (maybe what you used to help dirty the pan in the first place.) Now scrap out the pan with your spatula or pancake turner or whatever you call it. Loosen up whatever bits come off and dump those crumbs into the trash. Use another layer of salt to scrub the inside of your pan. This time, the salt shouldn’t turn as dark or collect as much moisture. Again, work around the bottom and along the edges, aiming for a smooth surface as the end result. Again, dump the salt into the sink. A good rinse will wash away the salt. Here’s where I cheat just a bit: I usually end up swishing a bit of water around the pan to make sure I’ve gotten it clean enough. Then I dry the pan off IMMEDIATELY with a clean paper towel. If the towel doesn’t turn yucky, the pan is clean. Drying off cast iron is really important. Water left on the surface of the pan can encourage rust, which is the enemy of cast iron. (Rust and re-seasoning will be dealt with in another post. But you don’t want to make extra work for yourself, so always thoroughly dry cast-iron after cleaning. Your pan should look something like this now. Maybe even better. Certainly, good enough! We are proud of 65 years of excellent Scouting experience provided to the hundreds of young men who have been members of Troop 244. Ours is a tradition of excellence and achievement. Troop 244 – September 24 at New Palestine Lions Club. We will begin at 5:00 PM with arrivals and a game. 5:30 we will have three half hour stations on scout skills. 7:00 PM we will have dinner. 7:30 we will have a campfire program. We need all scouts to attend as each patrol has a station and we need you help with the campfire program. There is no cost for the food or the over nighter (optional). Please join us as we show the webelos in Pioneer District what boy scouting is all about! Please join our at our booth at the New Palestine Lion's Club Fall Festival on September 8th, 9th & 10th. We will be leading the Parade this year again and we have invited the area cub scouts to join us. This major event kicks off the 2012 Friends of Scouting annual giving campaign for the Crossroads of America Council, Boy Scouts of America. It will be held December 12, 2011 from noon to 1:30 p.m. at the J.W. Marriott, downtown Indianapolis. The Governor's Luncheon for Scouting is an annual event where guests are given the opportunity to hear from Indiana's governor about the direction of our fine state and the positive effects that Scouting has in our communities. More than 2,000 business and civic leaders will again attend this prestigious luncheon. Each attendee will have the opportunity to pledge financial support to the Scouting youth program after hearing the impact it has on youth in Indiana. More than 400 volunteers and business leaders in our area will serve as Vice Chairs and Table Hosts for this event, meeting past and prospective supporters and friends to attend this year's luncheon. Their hard work helps us raise the necessary funds to continue offering a quality program to 35,000 Indiana families. For more information contact Victor George, Finance Director Crossroads of America Council Office: (317) 813-7062 Email: vgeorge@crossroadsbsa.org or Kristen Peoples at krpeople@crossroadsbsa.org. Silver Beaver nominations are due September 30, 2011 . The council has many individuals worthy of this high honor but, in order for them to be considered, an application must be completed and turned in. It is very important to follow the format of the application, which will be reviewed by a selection committee. The committee will not know the name of the nominee or the name of the person nominating. Selections will be based only on the information on the form. The process of gathering all the pertinent information for the nomination can be tedious and time consuming. Please consider working as a team with others to gather information and recognize/honor your nominee. If you have questions, please feel free to contact your district executive or email council@crossroadsbsa.org. We can have as many nominations as you feel deserve to be nominated. Thank you in advance for recognizing your fellow Scouts. The nomination form can be found on the council website under "Hot News" or by clicking here. Visit www.crossroadsbsa.org/training to find what training you need and what trainings will be offered in the upcoming months. This site will also route you to all the online trainings offered by the Boy Scouts of America! There are many exciting courses coming to the Scout Education & Program Center this month. We have a variety of courses to suite your needs ranging from Working with Youth Leadership in Your Unit to Scouting with Disabilities: Advancement. Do you have a campout coming up? Get prepared by taking Outdoor Cooking, Preparing for a Fall & Winter Campout, or Unique Cooking. Are you a new leader who needs training? Well, this month we're offering Cub Leader Specific Training, Outdoor Leader Skills Training, and BALOO. If you would like to attend or would like more information please contact volunteer@crossroadsbsa.org or (317)813-7116. And remember we are always looking to offer new courses so please contact us if you have a course idea or if you are interested in teaching a course. Working with Youth Leadership in Your Unit - Tuesday, October 18, 6 p.m. - 8 p.m. Merit Badge Counselor Training - Wednesday, October 19, 7 p.m. - 8 p.m.
Leave No Trace Awareness Workshop - Friday, October 21, 6 p.m. - 9 p.m. Outdoor Leader Skills Training - Saturday, October 22, 9 a.m. - 4 p.m.
BALOO - Saturday, October 22, 9 a.m. - 4 p.m.
Cub Leader Specific - Wednesday, October 26, 6 p.m. - 9 p.m.
We as a troop only do 1 fund raiser a year to support our troop and generate funds for the boys to apply to summer camp fees or any scout related activities. We wanted to give the boys more options of items to sale and to raise money for to offset the cost of scouting. We are adding a few more options for the boy to sell but we are waiting for the final paper work from the scout office to discuss these other options. Coming up are opportunities for our young men to sell popcorn. We are not expecting the boys to sale everything but only an opportunity to help off set the cost of scouting. If you are not interested in popcorn then trash bags or Christmas Wreaths will still be available. I will send out this information on the the other items as it is available. Well, we are doing as well as we can coping with the heat. 97 today. The Wednesday night trip was just the break we needed. The boys are drinking more water than they ever have. Most Merit Badge classes make them fill their bottles before they even start most classes. We still have plenty of Kool-Ade and Lemonade. Today I went in town and brought Ice cream sandwiches and such back for after dinner treat. We have had three boys advance in rank while at camp. Briar has completed Firecrafter Camper and Justin has completed Camper and Woodsman. There are several others working on this as well. Josh is working hard on his Firecrafter Rank and passed his campfire tonight. He is off on their overnight among trip. Gavin, Justin and Eddie slept in their Wilderness Survival shelters last night and survived. Some other will be doing it tonight as well. Some of us even went to catholic mass last night as well. There is a protestant service tomorrow I believe that we will encourage the boys to attend. We have had no problems with the boys wanting to take showers. some go twice a day. Forecast for tomorrow is going to much cooler at 93. I think they need a special patch for this one. Maybe the Inferno Badge. Yours in Sweating... I mean Scouting. Any adult coming to camp needs to check into the camp office by the flags. We will have one leader stationed on the porch to the left of the office. You may want to just meet us in town for dinner, unless you committed to drive. You might want to reply all and see if you can car pool. We are all prepared for the heat today. We have had no problem getting the boys to the shower. Sometime twice in one day. WOW. Medically speaking, we have only had a couple of rash issues and one blister problem. Gary is our medical officer and doing a fine job. We are all doing fine at camp. We got a little rain last night while going into the Dining Hall, but nothing after that. Settle the dust down a bit for us. Heat is a bit rough, but the boys are drinking plenty of water and lemonade. Thank you to Moans, Davis, Johnstons and anyone else I missed for the donations. We are icing it down every morning after breakfast and replenishing daily as needed. We had two scouts not pass the Swimmers Test, so we had to swap out classes. We really need to see what we can do to get year round aquatics in our program to better prepare our boys for this and life in general. Please give some thoughts to what you can do to help us here. Thanks to Mary Roberts for the T-Shirts. They have sure come in handy this week. There is going to be a heat advisory the rest of the week we are told by the staff here. They are all on alert for heat stroke symptoms and there are water stations everywhere. We should be fine. Sam Moan, building a kickball/baseball diamond at Sugar Creek Township Park. Austin Bravard, building a Nature Trail for an outdoor laboratory at the new Doe Creek Middle School. Great turn out for all three projects. We gathered together at the Sugar Creek Township Park Pavilion for lunch and fellowship - then "BACK TO WORK!" June 18 2011 - Chris Grunden, Committee Chair, facilitating the discussion. The Program Planning Retreat reviews the past year’s work, its problems and its successes. During this meeting our Boy Scouts planned next year monthly outings, special activity trips and Service projects. We worked the successful programs, with any changes into next year’s program, taking into consideration district events already scheduled and also looked at last year’s programs that were canceled to see what can be done to improve them. The Relay For Life is a life-changing event that gives everyone in communities across the globe a chance to celebrate the lives of people who have battled cancer, remember loved ones lost, and fight back against the disease. At Relay, teams of people camp out and take turns walking or running around a track or path. Each team is asked to have a representative on the track at all times during the event. No matter where you are, there’s a place for you at Relay and you can make a difference today by signing up online to start your own team or by simply making a donation. Thanks to Relay participants, we are creating a world with more birthdays a world where cancer can’t claim another year of anyone’s life. Thank you for volunteering your Saturday to help with this Event. Crossroads of America Council always has lots of great events for Scouts to enjoy and show their Scouting Spirit in our community. While we usually don't participate in those events as a troop, they are open to all Boy Scouts (and usually their families too!). - Scouts in uniform get in free plus their family members get in for just $5 each. Youth 12 and under are also free. Don't miss the chance to go down in the pits and meet the drivers and check out the cars! - Get a great deal on these special packages and enjoy some of the best racing in the country! Adults! Keep Troop 244 Running Smoothly. Merit Badge Counselor Training - Thursday, September 1, 7 p.m.-8p.m. This course is for any adult wishing to become a Merit Badge Counselor. Additional courses will be offered on the first Thursday of each month (10/6, 11/3, 12/1). Check back soon for additional course dates. Remember you only need to attend one of these dates to receive full training. Unique Cooking - Saturday September 10, 9 a.m.-11a.m. Learn some tricks of the trade for cooking competitions and fun new dishes you can use on outings with your scouts. Looking for some fun unique dishes to prepare on a campout or for the next camporee cooking competition? This is the course for you. Ever thought of steamed bread on a campout? We'll show you how. Come out and learn some of these unique ideas and have a chance to cook up some nice delights. Scout Drug Education Workshop - Monday, September 12, 7 p.m.-8 p.m. Learn about the effects and dangers of illegal substances from the experts, the Indiana National Guard - Counter Drug Task Force. This course is for any Scout or other youth wishing to learn about the effects and dangers of illegal substances or anyScout wishing to complete Second Class rank requirement 9a. Adult Drug Education Workshop - Monday, September 12, 7 p.m.-8 p.m. Learn about the effects and dangers of illegal substances from the experts, the Indiana National Guard - Counter Drug Task Force. This course is for any parent or adult volunteer wishing to learn about the effects and dangers of illegal substances. Stay informed for your Scouts; get the latest information on illegal substances. Poisonous Plants - Saturday, September 24, 10 a.m.-12p.m. Learn how to identify types of poisonous plants, symptoms of exposure, and ways to prevent contact. The class offers a detailed look at Indiana's poisonous plants and will be taught with a variety of props and identification materials! This course is for any individual wishing to learn more about poisonous plants. There are only 10 spots available for this session. Animal Tracks - Saturday, September 24, 12 p.m.-2 p.m. This course is for any individual wishing to learn more about identifying animal tracks. This course will allow you to get experience locating animal signs, learn tracking information, and gain knowledge of animals from Indiana and the surrounding areas. Participants will also learn how to make plaster molds! There are only 10 spots available for this session. Varsity Leader Specific Training - Saturday, September 24, 9 a.m.-1 p.m. This training is for leaders within the Varsity Scout Program and reviews the Scouting Ideals, Team Method, The Outdoors, Advancement, Association with Adults, Personal Growth, Leadership Development, and the Uniform. Outdoor Leader Skills Test Out - Saturday, September 24, 1 p.m.-3 p.m. This training is for Scoutmasters, Assistant Scoutmasters, and Cub Leaders within a unit that covers outdoor skills that you need to teach Scouts skills leading up to First Class. You will be given a study guide and have an opportunity to demonstrate your knowledge and improve on any weak points. First Aid & CPR Certification Class - Saturday, September 24, 9 a.m.-5 p.m. Retaining Your Older Scouts - Wednesday, September 28, 7 p.m.-8:30 p.m. This course is for any individual wishing to learn about retaining older Scouts. It will cover how to keep older boys active, how to get them to Eagle effectively and recruiting methods. This is a great course for leaders wanting ideas on what do to with their older Scouts. Again in 2012 the Crossroads of America Council will be offering a spring and a fall Wood Badge course.The Spring course will be under the direction of Ron Heustis and will be held on April 19-21 at Camp Kikthawenund and May 10-12 at Camp Redwing. The fall course will be under the direction of Stroh Brann and will be held August 18-20 at Camp Ransburg and September 15-17 at Camp Kikthawenund. 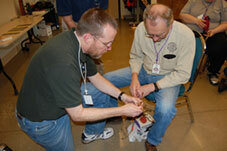 Wood Badge is the BSA's ultimate leadership training for adults. It offers a six-day immersion in the theory, practice, and experience of appropriate skills for leading others within Scouting and environments beyond the BSA. It accomplishes this by building all the pieces of the course on a foundation of five central themes. Wood Badge is designed to be valuable for all leaders, for Cub Scouts, Varsity Scouts, Venturing and Boy Scouts. The fee is $240. More information on the course can be found by contacting Tim Bouchard at tbouchard@crossroadsbsa.org. For those of you who haven't been able to take the Marlinspike Skills Course in the spring, it is now being offered in the fall. This September 16, 17 and 18, we will be teaching the Marlinspike I course at the Camp Kikthawenund. Please stop by theScout office and pick up an application at the front desk or call and reserve a spot. Applications are available on line atwww.crossroadsbsa.org . This course is limited to 15 participants, and spots will fill fast. We have just finished a weekend of knot tying skills instruction, Marlinspike I, II & III and everyone had a great time learning new knots and how to teach them. We also ate like kings! A staff of fourteen dedicated instructors taught 27 Scouters from across the Midwest from Friday evening until Sunday afternoon. We taught Turk's Head knots, the Ocean Plait mat, the Monkey's Fist knot, splicing, Pineapple knots, canvas sewing and a host of other skills and knots to students in three levels of instruction. The course dates for the Backpacking Awareness Training have been announced. The first of two sessions will be on October 8, 2011 at the Scout Education and Program Center from 8am to 5pm. This will be the indoor portion of the course. The second session will begin at 9am on October 22 and will end by 11am on October 23, 2011 at Camp Ransburg, this will be the backpacking portion of the training. Topics will include Trip Planning, Menu Planning, LNT, Gear and Equipment and much more. For more information on this training please contact Tim Bouchard at tbouchard@crossroadsbsa.org or Steve Taylor atstaylor@sill.com. This will be the last time this course will be offered and a pre-requisite for the course is that you complete the Kodiak training course. The Kodiak X course is being offered from November 4-6, 2011 at Camp Kikthawenund in Frankton, IN. In this weekend retreat many challenging activities and games will put your Kodiak Leadership skills to the test. More information on this course can be found by visiting the council website or by emailing Dave Broekers atbroekers91@comcast.net. Pow Wow 2011 will be held on November 5, 2011 at Warren Central High School, this is a new location for 2011. The theme is "Catch the Spirit of Cub Scouting". We are looking forward to having you present at this Cub Scout adult leader training. Please save the date and look for the official flyer later this month. The course will be 16 hours of LNT Training. Each participant will give a 15 minute presentation on one of the seven Leave Not Trace Principles. We will start the training on Friday night at 7:30 with classroom instruction and we will camp in a campsite with pit toilets. We will get up, have breakfast and then start with our presentations. We will stay in the campsite and have lunch. After lunch we will check to see if everyone has the right personal gear. We will divide the group gear evenly, so plan on carrying your share of the group gear. We will then backpack our overnight gear to a pristine campsite and have more presentations. We will hike 1 to 1.5 miles to our backcountry site. Here we will practice Leave No Trace Camping. This will be a backcountry site with no restroom; please be prepared to camp overnight. We will get up Sunday morning, eat breakfast and hike back to the campsite. Training will be over at 11:00 am. The 2012 University of Scouting is scheduled for January 21, 2012 at Warren Central High School. This training is based on the national 4 function plan and covers Program, Unit Service, Finance and Membership. Each year classes are designed to help units, districts and individuals improve the scouting experience. The staff has been working hard and the catalog is available at www.crossroadsbsa.org. The online reservation system will be up shortly but in the mean time if you want to get registered, please fill out the registration form and we will charge you the online rate. If you are interested in an electronic copy of the catalog please contact Sherry Webb at shwebb@crossroadsbsa.org or you can pick up a hard copy at any of the offices. We look forward to seeing you there in 2012. NYLT participants discover that leading themselves and leading others requires a vision-a picture of future success. Each team will develop a team vision for the course, and each individual will prepare his or her own vision. A constant refrain of NYLT is "If you can see it, you can be it." Through presentations and positive experiences in goal setting, planning, and problem solving, participants learn how to set a clear course toward realizing their team and individual visions, and then how to put themselves in the center of those pictures of future success. NYLT is held twice a year. The first session is from June 10-16, 2012. The second session is from July 15-21, 2012. Each session is held at Camp Red Wing located at5757 East Inlow Springs Road Muncie, In 47302.